I go out to do a lot of writing. There are three coffee shops within easy walking distance of my apartment, and each of them has their own characteristics. Canteen has friendly service and the customers are quiet; Dunn Bros has indifferent service and the customers are down on their luck; Bull Run has friendly service (first-shift hours only) and the customers are obnoxious hipsters and independent businessmen. They make lots of phone calls and have loud conversations. These noises need to be blocked out when I'm trying to write. Why don't I write at home? Two reasons: I'll get interrupted, and sometimes I need to change the vibe of my writing environment. I have to remove myself from the familiar to focus on creative writing. I need a chance of scenery, but the noises that come with it are unpredictable, whether it's a streaming online music feed that doesn't agree with me or some crusty old guy lecturing the trapped barista on politics. Or, of course, a series of banal phone conversations that must necessarily occur immediately around me, because that's my superpower, evidently. A number of Web-based noise generators are available, and I think that number is four. SimplyNoise was the first I was aware of. I sought a white-noise generator (having learned about white, pink and brown noise in a music class in middle school, concepts which have haunted me since) and found SimplyNoise. It's free but you can purchase the app for your mobile device. Besides levels of staticky hisses, it also provides natural sounds like "babbling brook" and the ever-popular rainstorm effect. Noisli also offers a basic word editor, which is a great idea: set up your sound cocktail, then flip over to the text editor and go fullscreen for distraction-free writing. It's not great when it cycles through pale blue because it's very difficult to see your text, but it doesn't last long. Now they also have an app you can purchase for you Apple product, but they're dragging their heels for Android service. The most recent update to Noisli permits users to start an account (free), by which they can save their favorite sound combinations and share these over social media. Super handy. I should note that the text editor allows you to download your writing so you don't lose it; unfortunately, now you only have access to the editor if you start an account. Given that Noisli's login screen can conflict with Chrome, this can be an annoyance, or you can simply set it to run in the background while you write in Word, Open Office, Scrivener, Celtx, Notepad, whatever you like. That said, it's my favorite, my go-to, and I recommend it to all my writer friends. Last night I got hit up by a rival service, Defonic, over Twitter. They appear to be a bald-faced ripoff of Noisli, but what do I know? I had to research to see which came out first. Hexillion tells me that Noisli's URL was registered in 2013 and Defonic's was in 2006, but the Internet Archive indicates that Defonic's URL was attached to a changing series of online services. The first recorded instance of Defonic offering a sound menu was in November 2013, while Noisli's October 2013 version (its first archived appearance) looks like it does today, with fewer options. 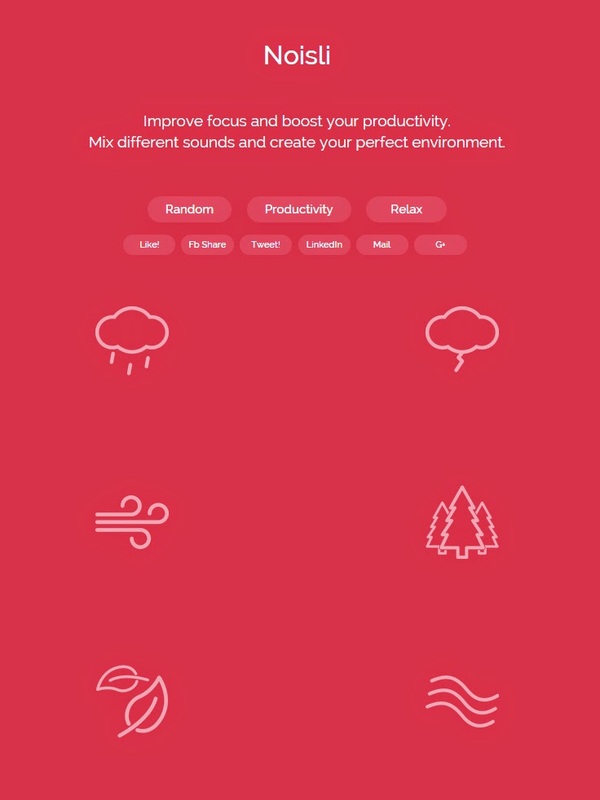 So if I had to guess, based on my research, I'd say that Defonic purposely aped Noisli's concept and interface. That's one strike against it in my book, regardless of how it performs. Blatantly imitating another site or service is low-down and underhanded; if they redid their interface, that would absolutely clear all this up. As of two days ago (as of this writing), Defonic offers an Android "Soundscaper" app that lets you play combinations of sounds. That explains the Twitter push. Incidentally, they have 22 tweets that start in July 2014; Noisli has over 11,000, starting in Sept. 2013. Another indicator of chronology. Anyway, how are their sounds? Pretty good. Despite the iconic selections looking nearly identical to Noisli's, their sound catalog is discrete. You can tell Defonic's thunderstorm, for example, is not Noisli's thunderstorm. They also offer nearly twice as many sounds: the snowflake produces the hiss of a snowstorm, clicking the umbrella gets you the patter of rain on a tin roof. The music note starts playing the famous "Gymnopedie No. 1" by Erik Satie. If you don't recognize the name, you will doubtlessly recognize this tranquil soundtrack to thoughtful moments, adored by filmmakers everywhere. They don't use Noisli's color cycle: you toggle between a daytime or nighttime color scheme. They don't offer a text editor (update: they do, see below), but if you click on the HD button, you get taken to a new landscape entirely. The screen fills with the shore of a lake at sunset, and you just stare at this and listen to ambient natural sounds or, I guess, leave it running in the background while you do other things. There are buttons to inject the chirp of insects or superimpose Satie's relaxing piano upon the idyllic setting. It's actually kind of nice. And in that screen, scroll down: there's another menu of backgrounds and sounds! You can look at and listen to a campfire; look out a rainy window while sitting in a cafe; let the frenetic lights of the city dance on your screen while tires on pavement and quiet engines generate a strangely calming effect. They offer even more options, too. If you're willing to tweet your progress, you can slide down the rabbit hole into an array of international ambiance, courtesy Hipster Sound, with a hidden menu for "piano bar," "jazz club" and other pretty well done effects. The songs in these are long fragments: they go on a while but they're incomplete, so, heads up if that kind of thing drives you crazy. Tweet again for a ZIP file of geometric backgrounds and music. I'm no hipster, but I used to be goth, and I remember when a band tried to break into the scene by announcing that it was goth and it was targeted toward goths, it didn't do so well. The best way to be accepted in the goth scene was to do your own thing and wait for them to discover and assimilate you. I wonder if hipsters work the same way. Probably not—they revel in consuming everything wrong. Still, more options is more. UPDATE: My error. I discovered where Hipster Sound keeps their basic text editor (in the Settings icon). It accepts basic keyboard commands for bold, italic and underscore. I don't see an option to download your copy, but it's easy enough to select all, cut and paste into your own file. UPDATE: I also discovered where Defonic keeps their text editor: click into one of the 2D video/audio options and scroll all the way down. There's a window where you can write right over the video image, which could be relaxing and fun. The last one I have to talk about is RainyMood. I hadn't heard of them until I followed Defonic's recommendation to another Twitter user, who stated he was addicted to RainyMood. 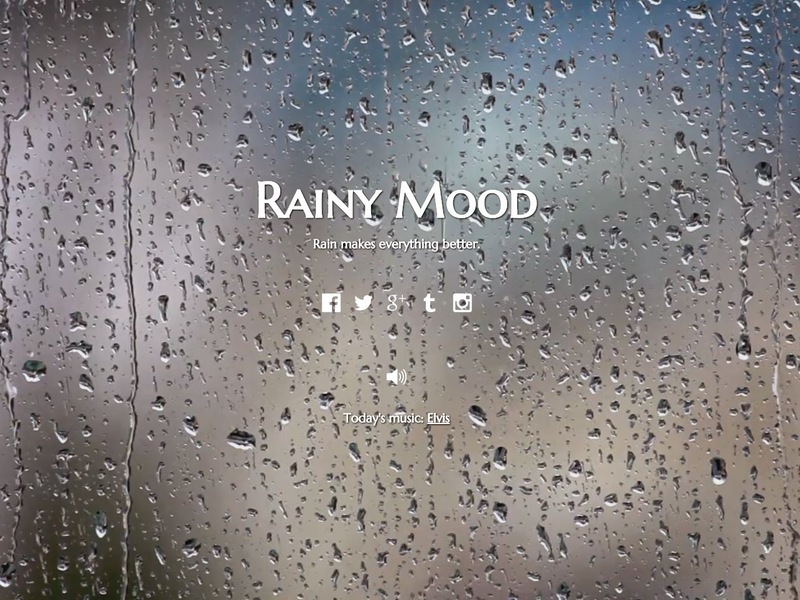 As you can see on RainyMood's main screen, they are fully engaged with social media. Scroll down for more options: they're available for Apple and Android products, which, you know, everything should be unless they're trying to be a divisive, tribalist tool. All it is, is rain. A thunderstorm. The screen is one huge image of raindrops clinging to or trickling down a window, which of course is attractive, and your speakers emit the classic rainstorm effect. The only controls are to toggle through three volume levels or to click on the music of the day. Users are encouraged to suggest a song to play along with the storm. I checked out today's selection and a YouTube video was embedded in the center of the screen, featuring Elvis performing "My Way." Go figure. So there you go! I'm sure there are many others, but as you can see many sites will begin to repeat each other. Whether they make better noises or offer better options is up for the consumer to decide.